All industries existent have their own share of myths and misconceptions. Some of these are because of apprehensiveness of the customers and the industry experts and others are engineered by the competitors to harm their influence. Blended learning is one of the central features of modern school reform, with proponents proclaiming that it helps personalize education, cuts costs and allows students to be more productive. Blended learning, where students’ face-to-face education is blended with internet resources or online courses, has been gaining considerable attention in education reform circles. It has become entangled with the ambiguous notion of personalized learning and is being positioned as the new way to individualize learning in competency-based education systems. As a concept, blended learning is now almost two decades old, having been imported into education from corporate education, registered training organizations and the post-secondary education sector. Many blended learning practices already fit well with a vast array of hybrid face-to-face and digital experiences that students encounter in schools, including distributed learning, distance learning or e-learning. 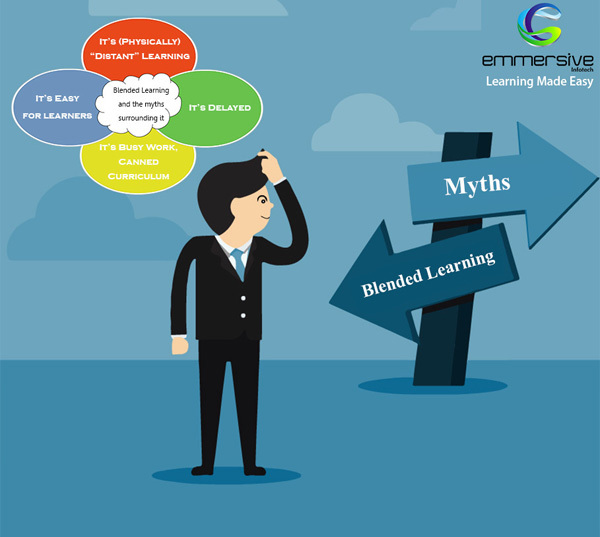 There are many misconceptions or myths about the blended learning that does the rounds and need to be sorted out. More and more online and blended environments come to resemble virtual versions of live classrooms, what we should see and have already seen is the opening of real-time interactive learning spaces and the presence of true discussion and collaboration. The work is still somewhat transactional, except that it can be accompanied by screencasts and videos a la the flipped model and even live discussions. Some learners may know how to use some technologies with more proficiency than the rest, but assuming that learners will know how to interact within an online environment when they have to do so in workplace or beyond is fallacious and irresponsible. It is unfortunate that the first term used to describe online learning was distant learning as it has carried into today’s structures, not all of which are physically distant at all. The spectrum of blended environments is so broad right now that online or blended can range from a teacher or student connecting across seas solely in a virtual space to a traditional environment with some online experiences and teacher interactions. Real-time class collaboration is sometimes prevented by geography, but the notion that we cannot learn in the same space at the same time, and through interaction, is a thing of the past. While there were a few lacking in interaction, the best ones involved a presenter leading a discussion, soliciting and answering questions, while simultaneously a chat took place between attendees commenting and expanding the discussion. Online or blended learning does not have to be physically distant, and it most certainly is not, by nature, emotionally distant. There are simply more ways to talk once we have removed time and space boundaries. Additionally, I have found that many learners who would refrain from raising a hand to ask for help will very easily send me a private chat message. So, it is very necessary to understand them and embrace the various advantages that blended learning had made on the present learning scenario. Nice post hope it will remove the doubts people are having about blended learning. I just want to say that blended learning give us best results as it is mixture of both ILT and eLearning . Which makes it perfect for providing behavioral training like sales training etc. Thanks Haritha, glad you liked it.